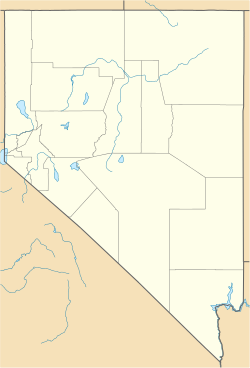 Middlegate is an unincorporated community along "The Loneliest Road in America", U.S. Route 50, in Churchill County, Nevada, United States. The local bar, gas station, and restaurant of Middlegate were the location for Black Road, Gregory Hutton's award-winning 2002 short film starring William Nilon. Stephen King stayed at the Middlegate motel for seven days and wrote a portion of Desperation. ^ a b "Middlegate, Nevada". Geographic Names Information System. United States Geological Survey. ^ "Black Road" – via www.imdb.com. ^ "A little slice of nowhere - Notes from the Neon Babylon - Opinions - July 5, 2001". News & Review. Wikimedia Commons has media related to Middlegate, Nevada. This page was last edited on 25 December 2018, at 20:34 (UTC).